Rani de Leon » [MIX] TIZITA RADIO Archives! Free Downloads + playlists. Please enjoy the archives from my monthly radio show on www.dublab.com. 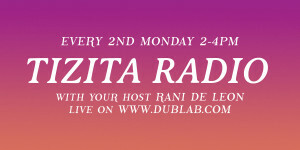 Catch the show LIVE every 2nd Monday of the month from 2pm-4pm. You can click on the archives below to DOWNLOAD each episode, and check the playlists for artists and song titles… enjoy!